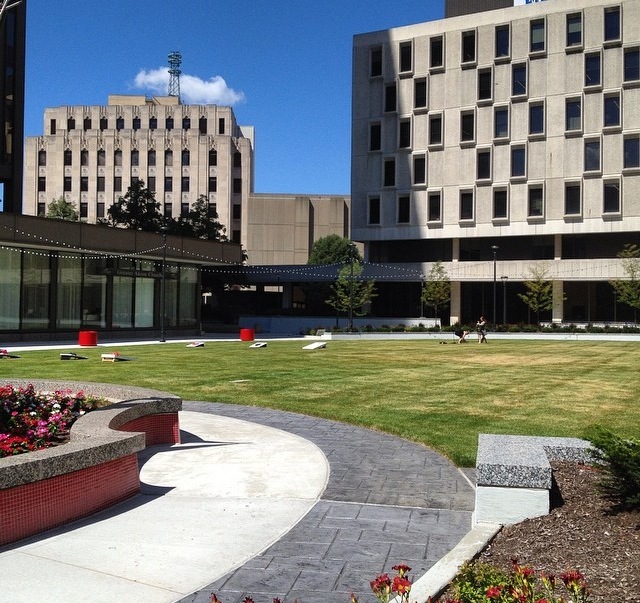 Cascade Plaza, a new addition to Downtown Akron’s vibrant atmosphere, attracts employees and residents of the area for games, music and relaxation. Developed recently this summer, Cascade Plaza, located along South Main Street, is a public spot many people frequent during their lunch hour, for the lively and beautiful environment it provides. The tables and open field give people an outdoor lunching area and a great escape from the office. Downtown Akron Partnership (DAP) hosts Summer on the Plaza, a program that brings events, musicians, and games to the new downtown hotspot, attracting more people to the area. As the summer intern with DAP, I get to experience Summer on the Plaza firsthand. 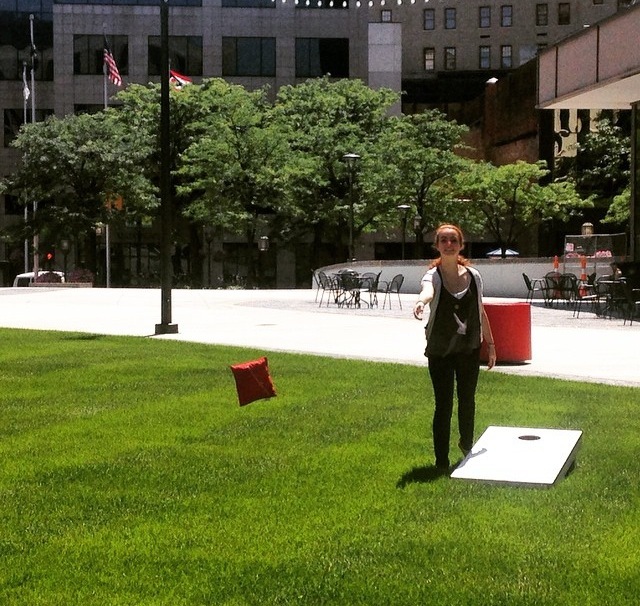 Participating in “Throwback Thursday” each week, a day that brings old recess games back to people in downtown Akron and onto the plaza’s field, I’m able to watch partakers roll up the sleeves of their office suits and get down and dirty in competitive games of corn hole. While every Thursday at 11:30 a.m. to 1:30 p.m. reminds participants of their past with games like bocce, ladder ball, and badminton, other days of the week attract people to the plaza as well. Tuesdays during lunch break hours, free concerts take over the Cascade Plaza. Artists such as Ohio’s own Michael McFarland perform free shows at the plaza. For the remainder of the summer from 12:15 p.m. to 1:15 p.m., Akron employees, residents and students are encouraged to enjoy their lunches on the plaza, entertained by some rock ‘n’ roll. Wednesdays welcome Namaste and downward dog with Yoga on the Plaza on evenings at 5:30 p.m. Akron Yoga & Wellness introduces free yoga classes, the perfect way to relax before heading home from work. I highly suggest to anyone able to utilize the resources of these free events to take advantage of this summer fun. And for anyone unable to attend the Summer on the Plaza events, I still recommend enjoying the sunshine and the beautiful surroundings of the Cascade Plaza during your down time. Summer on the Plaza occurs from now until September 3. Stop by to soak up the sun and free entertainment before the summer ends.